So this dish was originally going to be raviolis, but after taking a mental picture of the finished product the round panna cotta and round raviolis were a bit redundant. Quick fix, agnolotti! Agnolotti is simply pasta dough folded over a filling, and the shape is traditionally a half circle (though I have seen some square agnolotti… blasphemy!). Think of it like an Italian pierogi or wonton. I actually came up with this dish after tasting the wine I wanted to drink that evening, a Brunello di Montalcino produced by Salicutti, which was a beautiful balance of fruit, earth tones and super subtle anise notes. Below is the recipe, and below that is my recommended pairings… Let me know what you think! Please feel free to reach out to me if you have any questions or to let me know how it came out. So the first thing you need to get moving is the pork neck for the agnolotti filling. It’s going to take four hours to cook. You could employ a few different methods, a medium sized sauce pot on low heat (initially bring to a boil then reduce to low), in the oven at 300 degrees (covered with foil in a baking pan) or a crock pot… I used a crock pot. Add all of the ingredients for the Pork portion of the filling into the crock pot, stir, and set for four hours. Just after you get your pork going, you have to start on the panna cotta, which takes roughly three to four hours to set. Heat a sauce pan at medium and add your milk, cream, salt and pepper, stirring periodically. Once the fluids heat add your parmesan, stirring constantly until melted. Make sure you keep stirring, if you stop the cheese could sink to the bottom of the pot and start to burn, ruining the batch. Once the cheese is fully integrated into the mixture remove the pot from heat and slowly add your gelatin powder while constantly whisking. If you dump it all in at once it will clump together, so add slowly and vigorously stir. Once the powder is dissolved pour the liquid into a 5×9 pan and allow to cool slightly at room temperature. If you prefer you can also pour the liquid into separate ramekins. Once cooled down put in the refrigerator to set, remove from fridge approximately 30 minutes before plating. At any point while the pork is cooking you can start to get the rest of the filling together. Heat a small sautee pan, add butter, chopped mushrooms and garlic, sprinkle with salt and pepper. Cook at a medium-high heat until all fluids are absorbed and mushrooms and garlic are browned. Put your sautéed mushrooms into a bowl and mix with the ricotta and parmesan cheeses. Place in refrigerator until the pork is ready. Once the pork is done cooking remove from it’s braising fluids and allow to cool at room temperature. Once cooled pull the meat from the bone using a fork. Add the meat to the bowl with the filling mixture, stir together and add the salt, pepper & garlic powder. Place in fridge until needed. First we’ll start with the fennel broth. In a medium sauce pot melt your butter, add fennel, garlic, sugar, salt and pepper. Cook at a medium heat until the fennel and garlic start to sweat. Increase heat to high and add your white wine. Reduce the wine to half then add your chicken stock and bring to a boil. Reduce heat to low and continue to cook uncovered until ready to serve. If you realize towards the end that you cooked the broth at too high of a heat and lost too much fluid you can always add a bit more chicken stock or even hot water and allow to simmer for a bit longer. The reason for cooking this for so long is to get a more pronounced depth of flavor. Once the broth is cooking on low it’s time to start with the pasta. Traditionally you would make the pasta in a bowl by hand, but this is the 21st century people. God invented Kitchen Aids for a reason! Put your flour in a mixing bowl. In a separate bowl whisk together your eggs, water and olive oil. Add to the flour and mix, starting slow and moving up to a medium speed. You’ll have to judge the pasta a bit on your own… if too dry while mixing add a touch more oil, too moist, more flour. Once mixed turn your pasta dough out onto a floured surface and knead until smooth and elastic, approximately 8-10 minutes. Wrap in plastic wrap and let rest at room temp for 30 minutes. Pull your agnolotti filling from the fridge to let it come up in temp a bit. Next, in a sautee pan or sauce pot at medium-high heat add your pine nuts, stirring regularly so you don’t burn them. You really need to keep a close eye on these. Once the oils start to release from the nuts they’ll burn in moments. Once browned remove from heat and set aside. Now let’s work on the mushrooms to top the pasta. Get a sautee pan or medium sauce pot hot and melt your butter, then add your mushrooms, garlic, salt & pepper. Cook at a medium-high heat until fluids are absorbed and mushrooms and garlic are browned, set aside. Ok, back to the pasta… you’ve now let it rest 30 minutes. If you’re lucky enough to have a pasta attachment for your Kitchen Aid, good for you, go ahead and use it. If you don’t, like me, get ready to use some muscle and do it old school. Turn the dough back out onto a floured surface and start rolling it out. Your goal is a thickness of roughly 1/16 of an inch. Once you’ve achieved this use a medium sized ring mold to cut out circles and set aside. Take your surplus and knead back together and start over. You should be able to get approximately 24 agnolotti from the batch. Get a pot of salted water to a boil. Do it, do it now! So let’s stuff the agnolotti. First, get a bowl of cold water and a fork. Take your pasta circles, one at a time stretch them out a little, place a spoonful (I use a teaspoon, not the measuring kind, the stir your coffee kind) of the filling in the center. Wet the edges with water and fold over. Use the fork to crimp the edges. To get rid of any excess pasta I use the ring mold to cut the edges down closer to the filled center. Set aside on an oiled plate (so it doesn’t stick to the plate, and they don’t stick to each other). So now the mad rush to the finish line… First, get the large bowls that you’ll be serving in. Using a ring mold cut out circles from your panna cotta and place in the bowl. Boil your agnolotti until they start to float to the surface, roughly 2 minutes. 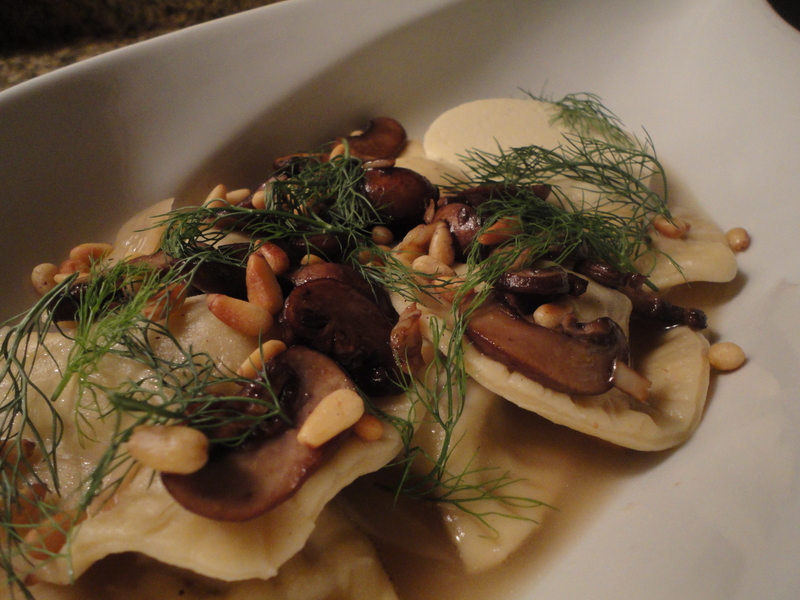 Using a slotted spoon remove the agnolotti from the water and put in the fennel broth, just long enough to moisten. Plate the agnolotti, then spoon the broth over them forming a nice pool in the bottom (I try to avoid plating the sliced fennel, I prefer just utilizing the broth itself). Top with the roasted mushrooms and sprinkle with the toasted pine nuts. Take some of the fennel fronds and put on top for garnish (and added flavor, they’re great!). One note, the panna cotta will start to melt into the broth… This is it’s intention! It’s not necessarily meant to be eaten on it’s own, it’s there to infuse the broth with that rich parmesan goodness. That’s it, you’re good to go, serve it! Now let’s talk about wine pairings… As stated above my whole basis for creating this dish was Salicutti’s Brunello di Montalcino. I strongly recommend a Sangiovese based wine that is slightly new world in style. So we’re looking at Sangiovese based Toscana IGT’s, Chianti’s, Brunello’s, Vino Nobile di Montepulciano, or even funky small production Sangiovese from California . The reason I say you want something that’s slightly new world is because you want good fruit up front, but you still want a touch of that Sangiovese rusticity and dry tannic backbone. Another key component you’re looking for is a subtle note of anise on the palate. So listed below is what I would recommend. Rodano Chianti Classico, Toscana, IT – Never heard of Rodano? Well, you probably should have. The owner and winemaker, Vittorio Pozzesi, is the President of the Chianti Classico Consortium, so he’s kind of a big deal. As far as his wine goes, notes of sweet cherry, plum, anise and dried pantry spices play on the palate with subtle acidity and a subdued tannic backbone. At $16-19 on the shelf this wine is a steal! And with 8,000+ cases produced it’s not large scale production, but it can be found. Field Stone Sangiovese Lucio’s Block, Alexander Valley, CA – This wine is certainly difficult to find with only 275 cases made per vintage, but it’s worth the hunt! Chances are you’ll have to order it directly from the winery (http://www.fieldstonewinery.com/) at a very reasonable price of $25 per bottle. Notes of ripe cherry, dried cranberry and anise play with moderate acidity and round tannins, giving a beautifully structured mouth feel. Podere il Macchione Vino Nobile di Montepulciano Riserva, Toscana, IT – Seriously full bodied with notes of fresh berries, crushed mountain flowers, dried herbs (including anise) and tobacco. Macchione is a small family run winery with roughly 6 hectares of vineyard, producing Vino Nobile the way it’s meant to be made. Also not easy to find in the States, but if you can… grab it! You’re looking at mid-$30’s on the shelf. Podere Salicutti Brunello di Montalcino, Toscana, IT – Salicutti is a small winery, with only 5 hectares of vineyard, and they are the first producer in Montalcino to receive an organic certification. They only make about 700-750 cases of their Brunello per vintage. On the palate you’ll notice notes of red cherry, raspberry, anise and almond, with very subtle oak presence, moderate acidity and soft tannins that lead to a long, lingering finish. The current ’08 vintage is very young and needs at least 5 years before it starts to come into its own, but if you can find an older vintage hop on it! Or get the ’08 and sit on it… or open it two days before you want to drink it (seriously). This is the most expensive of the bunch, coming in at $70+ on the shelf. Tags: agnolotti, chianti, fennel, field stone, macchione, panna cotta, parmesan panna cotta, rodano, salicutti, sangiovese, savory panna cotta, vino nobile. Bookmark the permalink. Previous post ← Did I call it or what! ?